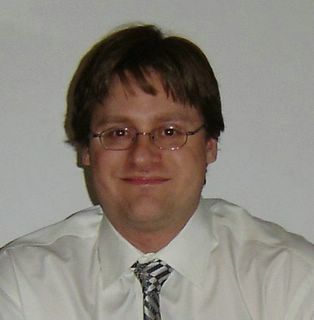 In the fall of 2010 I taught Chemical Information Retrieval at Drexel for the second time. Here are some things I learned. 1. Needed a new wiki. (link here) When I teach a new organic chemistry class, using the same wiki (CHEM241 CHEM242 CHEM243) makes sense because the content doesn't change for the most part, except for test dates and locations. I considered using the same wiki (from 2009) for Chemical Information Retrieval but the nature of the course made that impractical. With the large amount of student generated content in the form of research logs, reports and assignments, it would have been too confusing. In several ways, last year's wiki proved to be a useful resource. It was convenient to show examples of how to complete the various assignments. Last year's FAQ covered a lot of basic questions and was assigned as study material for the final exam. This year's FAQ could then cover some more subtle aspects of the current state of chemical information. 2. Abstraction to a database format is worthwhile. As I described in more detail elsewhere, this year I had students enter chemical property information from different sources in a Google Spreadsheet instead of just free style on the wiki. It took some time to validate each entry but I am very happy with how the exercise turned out. The dataset can now be properly mined using automated tools and statistics about the current state of chemical information retrieval are now available for a variety of uses. 3. Continuous anonymous feedback by poll is easy. After attending a technology symposium at Drexel I learned about the free polling tool from PollEverywhere. I provided a link on the wiki for students to provide feedback anonymously. They could use their phone to text but in this context I think the web interface is enough. I did get a few submissions which were helpful so I'll continue using this next term. 4. Guest lectures are useful. Again this year I invited a few speakers and they were outstanding. Elizabeth Brown spoke about the semantic web and Dana Vanderwall covered recent trends in drug discovery and cheminformatics, including the sharing of data by pharmaceutical companies. Both speakers agreed to make the recording of their talks available and I think these presentations will be useful to others outside of my class. 5. Classroom design matters. Because students need computers for this class, my options for classroom design are limited. This year I had a classroom with three rows of connected and immovable tables and very little room to walk around. This made it difficult for me to quickly get to students with questions about their projects. It also proved to be problematic for a game that I experimented with involving finding specific papers with chemical properties for a given molecule. We are limited to 4 SciFinder licenses so I had students form 4 teams with one student in each team using SciFinder and the others using the other tools at their disposal. Because students could not easily move around and sit next to each other it created a lot of confusion. I had never really fully appreciated the huge impact of classroom design on teaching modalities. On November 12, 2010 I presented on "Using Smartphones, Wikis and Games for Teaching" at the Drexel Faculty Technology Showcase. I included my most recent experience with using smartphones to deliver recorded lectures and play games, especially the ChemTiles game. 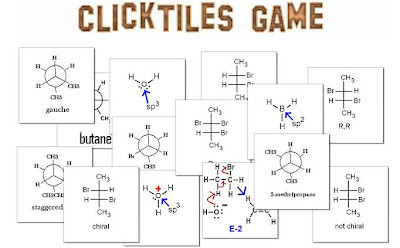 In the spirit of encouraging educators to experiment with this type of tool, Andrew Lang duplicated the code for the ChemTiles game and we re-branded it to the more general "ClickTiles". Anyone can create their own content easily by generating images (jpeg or bmp) that are 256 x 256 pixels and uploading them to this Flickr group. Simply name the images starting with "true" or "false" and tag them into a desired category. Paint is an easy to use free program that works well to create the tiles. View more presentations from Jean-Claude Bradley. I had the pleasure of presenting a talk on "Technology and Students - Mix, Match or Miss?" at the Villanova Teaching and Learning Strategies Symposium on May 13, 2010. Topics covered included screencasting, wikis, games and Second Life, with a particular focus on student response to these technologies. My host, Carol Weiss, did a fantastic job of putting together a panel afterward with several students and myself to discuss educational technology with the Villanova faculty. Everyone seemed to genuinely want to find better ways of teaching and learning while expressing a healthy skepticism of new technologies. I agree that there is no panacea in this field but there are some tools that can be very useful for certain educational objectives. I tried to show them what kind of approaches have worked for me and how students have responded. Technology and Students: Mix, Match or Miss? On March 25, 2010 I presented at the Drexel E-Learning 2.0 Conference on "Education 2.0: Leveraging Collaborative Tools for Teaching". It was an opportunity to update my slides with what I did and learned from the Chemical Information Retrieval course I taught over the Fall 2009 term. I described using a wiki to organize course content and to allow students to contribute useful resources. Their assignments were also designed to be useful to other students in the class as well as to the general library and chemistry community. I covered using wikis and other collaborative tools to mentor students doing laboratory research with Open Notebook Science. At the end I provided a quick overview of using games and Second Life for educational purposes. 1) Research Logs work. In analogy to the Open Notebook Science approach I use in my research lab, I wondered if there was some benefit to having students keep a log of what they were doing to research the topic for their paper in chemistry. That way, using the wiki I could comment in bracketed bold text to either answer a question directly or make suggestions for which resources or directions might be fruitful. (see example) This certainly did not replace the weekly face to face interaction but it was useful for the days we did not meet. An unintended benefit of this is that as soon as students starting keeping a log our Sitemeter would show hits from Google searches that were effectively answered by even the limited content already there, with links to relevant papers. Even though as scientists we are trained to only expose our final comprehensive work to the public, the reality is that most people are looking for very specific information that does not require a massive compilation to answer. 2) Student generated content can work. I wanted for the class to cover the absolute latest developments in chemical information retrieval so I experimented by creating an FAQ of questions on hot topics of the day, many of which I didn't know the answer to. The students were assigned to answer one question each -and even suggest a new question if desired. I think this worked even better than I imagined, although it did take a significant amount of time for me to iteratively give feedback by pointing out inconsistencies with the information in cited sources or suggesting additional documents to research to properly address the questions. After the due date for the FAQ assignment, I did complete a few answers myself since this the final exam was based on this content. In another assignment the students had to find 5 different sources for 5 experimental properties of compounds of their choice. A major objective of this was to make students appreciate how difficult it is to find reliable data - even with access to the best commercial databases. But as an additional benefit, these aggregated results provided valuable information to the chemistry community about the state of online chemistry information today. It can serve as a benchmark to compare in the coming years to see if things are getting better or worse. Some of the results even uncovered errors that were corrected in ChemSpider and CAS. For extra credit, Tony Williams provided some particularly difficult stereochemical incorrect assignments in ChemSpider and two students provided solutions that were corrected in the database. 3) Students are shy. Some of the FAQ questions were tricky to research because they involved very recent issues that might not yet have been covered in traditional journal articles. I suggested contacting librarians, authors or editors either directly or via social networking sites but most students were reluctant to do so, even if it meant saving a lot of research time. An example of a tricky question is the current ACS policy on self-archiving. It was difficult to find a complete answer just searching the web while a quick post on FriendFeed gave me the information I was looking for with the appropriate reference (by way of Dorothea Salo and Graham Steel). I don't know how much of this type of productive participation in scientific networks can be learned. Even if there is a personality trait that predisposes someone to take naturally to it, certainly a proper etiquette and ways of finding specific networking platforms and groups can be taught. It is in this spirit that I have assigned my students in previous terms (and my current course) assignments to interview and interact with scientists on FriendFeed and Second Life - and this term at a student's suggestion we'll try FaceBook. I don't feel comfortable making this mandatory but I do think that students who take advantage of this opportunity stand to gain a significant competitive edge over their classmates if they continue to make use of these resources. 4) Privacy not popular. Students were asked to write their assignments on a public wiki. I always want to be sensitive to the fact that some students may not want their names to be associated with work that is open. As I always do I gave students the option of using their real names, initials or pseudonyms. All but one chose to use their real names. This seems a little counter-intuitive given their reluctance to participate in social networks. With public work the instructor has to be careful about providing feedback. Although I did point out simple errors or discrepancies and make suggestions online, I made more critical comments in private either by email or in person. In the end I think the students can be proud of the work that they accomplished. A month after the course ended the wiki still gets about a dozen hits a day from around the world. My first organic chemistry class (CHEM242) took place on Monday. That was the introductory lecture where I explained how my online-optional class works. The fundamental building blocks of this course are my recorded lectures. That's why it was a particularly unpleasant experience to find that my m4v files just played static to my understandably skeptical audience. I had never had this problem before. I tried re-installing iTunes but neither that nor the simple QuickTime player worked. Some of my students were able to view the files ok through iTunes so it must be some configuration issue with my laptop. I was expecting the worst at this morning's workshop when a student suggested using VLC. Not only did it work but I could swear the resolution was far better than when viewing on iTunes. The fact that VLC is Open Source is very exciting. That should make it easier for developers to create OS educational multimedia applications. On September 29, 2009 Erica Yuen defended her masters thesis on using Second Life as a platform to perform counseling with people suffering from Social Anxiety Disorder. Her committee was composed of Ronald Comer, James Herbert, Jean-Claude Bradley and Evan Forman. The project went very well, showing similar effectiveness and drop out rate compared with face to face counseling. There were some technical issues and some patients did not like the absence of non-verbal cues from the interaction. But overall Erica clearly demonstrated the great potential in using virtual worlds for counseling, especially for people far removed from metropolitan areas. Tannis Morgan just posted her interview of me on her blog: Learning and Teaching at BCIT. The 13 minute audio recording covers how my teaching practice has evolved to include screencasting, podcasting, wikis, blogs, Second Life, games and workshops instead of lectures. 1) My Second Life extra credit assignment was very different this term. Instead of having students create exhibits with 3D molecules I focused on the networking opportunities in chemistry. Students had to interview 3 people on Second Life and 3 more on FriendFeed and find out why they are participating in social software and how it relates to their interest in chemistry. They also were asked to take snapshots of chemistry related objects in Second Life. Even though only 4 students did the project what results is a wiki page that could be useful for briefing people about what exists for chemistry on social software platforms and why people bother to participate. Think about what helpful resources could be generated if a few teachers from various academic fields gave out similar assignments for just one term. 2) ChemTiles game: Leveraging the code that he used for the Spectral Game, Andrew Lang created a web version of the quizzes that I have used in Second Life and Unreal Tournament. Having browser access made it much easier for students to participate and the use of high scores allowed me to run contests over a week instead of just one class session. I ran three contests and gave out a textbook as a prize. I added a lot more content to cover chirality, nucleophilic reactions and eliminations. In addition to the contests, sometimes we just played the game in small groups at the workshops. Just like with the Spectral Game, when run in groups I used the images that appeared as opportunities to discuss in depth some of the related course material. Some students were motivated to beat the high score and the game was a useful addition to the resources available to teach the course materials. There isn't a single tool that will appeal to all students. A recurrent finding in my teaching is that the more channels are offered to students the more choice they have and that can make learning more pleasant and interesting. But all methods of instruction require active participation on the student's part. Even though I will not be teaching organic chemistry again till January (I am teaching Chemical Information Retrieval in the fall) the ChemTiles and Spectral Games will be freely available to other teachers and students. I have been fortunate throughout my life to have had lucid dreams on a fairly regular basis. This is an extremely interesting experience on many levels. Since you know you are dreaming, in principle none of the rules of reality are necessarily applicable. For example walking through walls and flying around are usually possible. But other powers are curiously not on the menu. I have not been able to make objects materialize or directly control the actions of people. However, telekinesis is often possible. I find it interesting that the ways of invoking these actions is almost identical to the technologies that I have become accustomed to using, especially Second Life. Telekinesis is achieved by holding out my arm in the direction of the object and executing a kind of mental "right mouse click" then moving the object freely in 3D. 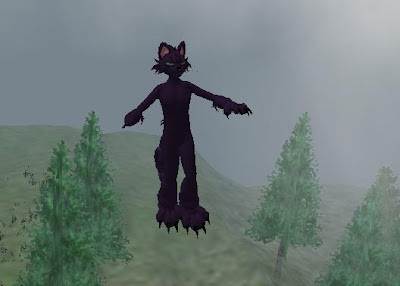 Flying can usually be initiated by lifting my arms, exactly the way it appears in Second Life. Last night I was following somebody flying around and his arms were in the classic Second Life flying position. He was going so fast that I was wishing I could pull up a mini-map view and chase him as a green dot, as is done in Second Life. My interpretation of this is that the way our subconscious solves problems is governed by following rules that it has learned from experience. And the technology we spend time using sets the parameter space of what is allowed or possible. If this is true it suggests that spending time in diverse complex environments could make us more creative. I think this has implications for how researchers think about and plan their experiments and how they collaborate and teach others. I would bet that getting used to telekinesis in an environment like Second Life makes you more susceptible to thinking about remotely controlling experiments or using robotics. Similarly using a tool like the Amazon Mechanical Turk extensively in research must change the way you automatically conceptualize the role of people in projects. It is fascinating how simulated people behave in lucid dreams. I think my subconscious does a good job of replicating the social mores to which I am accustomed, whether in person or via social software. Basically the people in lucid dreams display a range of personalities. To get them to interact, first you have to find the friendly ones then approach them politely. I wonder if the simulated people in the lucid dreams of those in the military obey direct orders without any problem. Because they certainly don't take kindly to it when I try. Another surprising property of the subconscious in a lucid dream is that it behaves like a separate individual. You can speak to it and it understands, sometimes responding with a sense of humor. As I mentioned before, I have never been able to make an object materialize in front of me just by willing it. But what I can do is say out loud "You know it would be very nice for you to make me a nice juicy steak - and don't forget to activate my sense of taste." Nothing will happen for a few seconds but as I turn a corner there will be a meal waiting. So in a very real sense, if the subconscious plays the role of God in lucid dreams, "prayers" do get answered sometimes! Andrew Lang and I just did two presentation on applications of chemistry in Second Life. The first was on April 24, 2009 at the "Virtual Worlds: Libraries, Education and Museums" (VW LEM) conference on Infotainment Island. The second was on April 29, 2009 at "Education Days" on Orange Island. This was basically an updated version of the talk we gave at the ACS last summer. We showed how the ChemTiles and Spectral Games evolved from Second Life. That is interesting because usually Second Life applications are adaptations of projects initially conceived elsewhere. As I mentioned previously, giving talks on Second Life or using some other form of tele-presence certainly has its advantages. It does not replace face to face interaction but I think people get a good idea of what we do and they can follow up later for more discussion or possibly even collaborations. I enjoy presenting with Andy - we go back and forth depending on the content on the slide and when it is relevant Andy does a demo of how to rez a molecule right on stage. So far we have not had any technical problems with that and I think it drives home the message of how easy it is to use the orac rezzer. The talk on Orange Island was recorded and I'll update a link to it here when available. This term I am teaching introductory organic chemistry (CHEM 241). As an extra credit assignment, students had to use FriendFeed and Second Life to find 3 people on each platform doing something related to chemistry. They also were asked to take 4 pictures of chemistry content in Second Life. The first of 2 deadlines related to this assignment has just passed and 4 students completed the assignment. I think they did a great job - take a look. I think the networking aspects of these platforms is immense in educational fields. But it requires overcoming a bit of a barrier to entry, which was the purpose of this assignment. Students did need a bit of guidance at our workshops to get going but they caught on very quickly. Thanks to everyone who agreed to be interviewed! 1) The big news of the term is that I had a chance to try out the SpectralGame in my class for the first time (mainly to teach NMR). Andrew Lang first created the game in Second Life and it worked fine but there were only a few students willing to go to the trouble of setting up an account there. By creating a web version the game became much easier for anyone to access. Antony Williams then assisted us with providing spectra from ChemSpider and Robert Lancashire made some modifications of JSpecView to increase security. Andy also happened to create a top score list, which turned out to be a key to the success of the game and removed the necessity to set aside time during the workshops to run races. Now I could just specify a date and give out a prize to the student from our class who scored highest. That worked well and I gave out 3 prizes this term (molecular model kits and a textbook). We're submitting this for publication soon - see draft. 2) I usually provide a small (2%) extra credit assignment for students who want to go beyond what we learned in class. During the past few terms I have asked them to do projects in Second Life to learn how to create 3D molecules and posters. Since we didn't do any races in Second Life this term I asked them to focus on NMR analysis and upload their reports on the class wiki. They had to find an NMR spectrum on ChemSpider and explain the peaks. Normally I get maybe hald a dozen submissions but this term there were 35! (out of 135 students). Next term, I will have to re-evaluate Second Life to see how to leverage what is best done there. 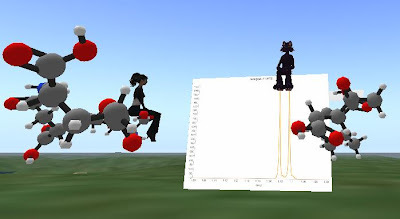 Yesterday I used the NMR game in Second Life during our 2-hour Friday workshop in CHEM242. (We used a new location on Drexel island SLURL) The students who attended had looked at little or no material prior to the workshop. By the end I ended up explaining chemical shifts, complex coupling patterns and diastereotopic hydrogens differentiated by the presence of a chiral center. The only concept we didn't cover is integration, although we used peak size to take a guess about groups with lots of hydrogens (like trimethyl). I think it was a very efficient way to teach NMR and the students can now go off and continue to practice till our next workshop Monday. Second Life has some advantages - such as the ability to mediate group study sessions where students from remote location can come together to play and discuss spectral assignments using either voice or chat. It is also nice to see the molecules in 3D, especially for bridged cyclic systems. However, there is a bit of a learning curve to get into Second Life and not all computers have a suitable video card. So it is nice to now have the ability to play the game on a web browser. Andy set up the game play so that the score reflects the number of correct answers obtained in a row. There are also only 3 molecules to choose from instead of 5 in Second Life. We're using JSpecView to render the spectra so expanding peaks simply requires dragging the mouse across the area of interest. It is also possible to integrate and view the metadata by right clicking. 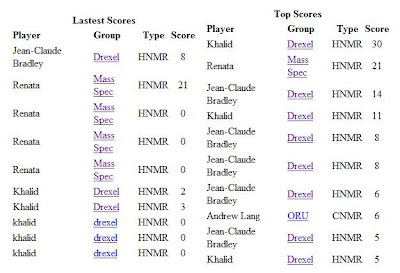 Currently we mainly have H NMR spectra but we'll be adding lots more C NMR, IR, UV, MS, etc. It all depends on how many Open Data contributions we can find. If anyone has spectra to donate please upload them to ChemSpider and don't forget to check the box for Open Data. This has been a wonderful example of rapid collaboration by Andrew Lang, Rajarshi Guha, Antony Williams, Robert Lancashire and myself. Andrew Lang and I have been discussing publishing our work on chemistry and Second Life. We're working on the draft here. When going over the game section, it became clear that we'll probably need to make two manuscripts out of this. This is an opportunity to wrap up my previous work on the EduFrag project - using Unreal Tournament to teach organic chemistry. I had submitted that article but as it was going through the peer-review process the approach was essentially made obsolete when we adapted the quizzes to Second Life. So Andy and I brainstormed some new chemistry games that we could introduce to Second Life to leverage our recent tools. One of the applications is the NMR game. By combining the orac molecule rezzer, the SL spectral viewing tool and ChemSpider Open Data spectra I think we have a pretty good game. The idea simple: click on the molecule that is represented by the spectrum. If it is correct you get 2 points and get another spectrum. You lose a point by clicking on an incorrect molecule. After going through all the spectra your score gets posted on the web to a top10 list. For equal scores the best time takes it. From an educational perspective this is useful I think on several levels. First the ability to look at the molecule in 3D makes it easier in many cases to demonstrate the relationship between Hs, which is critical in NMR. Second we are using real spectra - not simulations. That is a great opportunity to teach students about how to deal with impurities, solvent peaks or quirks in the peaks. The viewer allows for easy zooming by typing commands like "zoom 1.5-2.5" in the chat box. Third this spectrum viewer uses Open Source JCAMP-DX files so it can (and will) be adapted to all kinds of spectra - like IR, UV, MS, C NMR, etc. I'm teaching (CHEM 242) all of those techniques this term so I'll have an opportunity to see how well it works. There is currently a copy of the game on ACS island (SLURL) - give it a try and give us some feedback. My review of the new book "Opening Up Education" has appeared in Nature today [Bradley, J.-C. Nature 457, 151-152 (8 January 2009) ]. The entire book is freely available online by MIT press. In addition, Nature has agreed to make my review freely available. Given the topic, this is very satisfying. Education is changing. The ethos of openness that increasingly pervades activities from journalism to software to finance is being adopted by the educational community. The series of essays in Opening Up Education offers examples, opportunities and thoughts on the use of shared and freely available resources in education. The book is arranged in three sections: software, content and pedagogy. Can the success of Scientific Blogging be measured? Timo Hannay recently gave a talk "Scientific Researchers and Web 2.0: Social Not Working? ", which is reproduced in this Nascent blog post. This is a sobering review of the state of social software in science and he lists several roadblocks to its widespread adoption. It is important to counterbalance the almost unavoidable hype that emerges from the enthusiasm of those energized by a movement. However, it can be a tricky endeavor to attempt to define success or failure, especially within systems that are evolving rapidly. Are you a failure if you only get 10% of your proposals funded? What about a telemarketer who has a 95% failure rate of making a sale from dialing the phone? Are you a failure if you send a paper to Nature and get turned down 90% of the time? The way I see it, Web2.0 technologies are just communication vehicles and should be measured using similar metrics to the telephone, email, lunch meetings, conferences, talking to somebody during a flight, etc. Well, as one graduate student that continues to blog even though only 2 or 3 people read most of my posts (namely my Dad and occasionally, if she is bored, my wife), I feel compelled to say that yes, some people and even some scientists will continue to blog even if no one ends up listening at all. For me, keeping a blog is a very convenient way to write-up my annual reports and keep track of my progress. But, as a bonus, if others read it and give me feedback or collaborate, all the better. And this is where the sweetest part of the icing is found. As Rich Apodaca mentions, it comes down to jobs, funding and collaborations. I have personally experienced very good examples of that. My recent trip to the UK (generously funded by Cameron Neylon) would have never happened without my active participation with Web2.0 tools. The same goes for the last paper (submitted to JoVE - Precedings version here) and proposal that I submitted. The best reason for blogging is self-interest. I have created the FriendFeed room Future-of-Education as a means of gathering and sharing information about the future of education to assist a task force at Drexel seeking to create an environment to nurture new educational initiatives. At the first meeting last week I shared my thoughts about the growing importance of openness in both education and research. I invite other members of our task force and any others from around the world to share relevant information and thoughts. Hopefully I'll be able to liveblog one of our upcoming meetings on FriendFeed. This has worked very well at recent conferences - see for example the Southampton Open Science Workshop. More info on this after I discuss it with the committee. The Department of Chemistry at Drexel University is seeking an outstanding candidate for a tenure-track position at the assistant professor level in any area of chemistry. Candidates must hold a Ph.D. degree in chemistry or closely related field, have a strong commitment to teaching, and are expected to establish a vigorous, externally funded research program. Postdoctoral experience is preferred. Teaching responsibilities may include general chemistry as well as undergraduate and graduate courses in your area of specialization. A C.V., publication list, statement of present and future research interests (5-10 pages), statement of teaching philosophy (1-2 pages), and at least three letters of reference should be sent to Dr. Kevin Owens, Search Committee Chair, Department of Chemistry, Drexel University, 3141 Chestnut Street, Philadelphia, PA 19104. The review process will start on October 1, 2008 and continue until the position is filled. The successful candidate must be qualified to work in the United States. Drexel University is an affirmative action/equal opportunity employer and encourages applications from qualified women, members of minority groups, disabled individuals and veterans. I usually limit my book reviews to Goodreads or Shelfari but this one deserves much more attention. In Happy Accidents: Serendipity in Modern Medical Breakthroughs; When Scientists Find What They're NOT Looking for, Morton Meyers reviews examples of the unpredictability of scientific progress. This could just be a collection of interesting anecdotes - and some of the stories are truly fascinating. My favorite is probably the discovery of platinum compounds for the treatment of cancer. It came about from the accidental electro-dissolution of a platinum electrode during an experiment studying the effect of electricity on cell cultures! The dominant convention of all scientific writing is to present discoveries as rationally driven and to let the facts speak for themselves. This humble ideal has succeeded in making scientists look as if they never make errors, that they straightforwardly answer every question they investigate. It banishes any hint of blunders and surprises along the way. Consequently, not only the general public but the scientific community itself is unaware of the vast role of serendipity in medical research. Typically, a discoverer may finally admit this only towards the end of his or her career, after the awards have been received. An applicant for a research grant is expected to have a clearly defined program for a period of three to five years. Implicit is the assumption that nothing unforeseen will be discovered during that time and, even if something were, it would not cause distraction from the approved line of research. Yet the reality is that many medical discoveries were made by researchers working on the basis of a fallacious hypothesis that led them down an unexpected fortuitous path. Indeed the basic process of peer review demands conformity of thinking and disdains a maverick's approach. The fact that some of us in the Open Science community are discussing this does not mean that we are advocating for the abolition of peer review or the NIH. We are not that naive. We still submit proposals and manuscripts for publication in peer-reviewed journals (although given a choice we probably would pick an Open Access journal over one running on a paid subscription model). The point is what we do in addition to all those traditional processes. We can share our failed experiments. We can share our research plans. We can discuss science freely admitting what we don't know. We can record our talks at closed meetings and make them public. We can initiate and participate in serious scientific conversations going on in the blogosphere without worrying about everyone's title and rank. Basically, we can collaborate in ways that are most conducive to serendipitous discoveries. The free social software, databases and other infrastructure now available make this information exchange easier than ever. The key question for a researcher today: to hoard or not to hoard? To me, it seems likely that data hoarders will find it more and more difficult to claim priority for a contribution when competing against loose associations of open collaborators motivated by insatiable curiosity. Some of the folks from the funding side are getting it. Take a look at SubMeta. By 1930, every European scientific journal would automatically accept and publish any paper that Einstein had submitted. We (Mr. Rosen and I) had sent you our manuscript for publication and had not authorized you to show it to specialists before it is printed. I see no reason to address the - in any case erroneous - comments of your anonymous expert. On the basis of this incident I prefer to publish the paper elsewhere. There are many ways to look at this, depending on one's agenda. On the positive side, it looks like Einstein was able to contribute to science, despite using the publication system much like we would now use Nature Precedings or a blog. But did the readers know his papers were not peer reviewed? At least with our current Science2.0 tools the assumptions are more explicit. And it is much easier for the community to comment. I was just looking at the YouTube Insight feature showing demographic and access info on my uploaded videos. Since I use my YouTube account mainly to provide solutions to organic chemistry problems in my undergrad classes it was surprising to see that the most active group of viewers were 45-55 year old men. And the most popular video is the NMR of an ester, where I explain the effect of a chiral center on the splitting pattern of methylene groups. It has been 2 terms since I posted a post-mortem analysis of my teaching experience. In the Winter08 quarter I taught intermediate organic chemistry CHEM242 and in Spring08 I taught the introductory organic course CHEM241. 1) I still struggled to find a good way to proctor my online tests for up to 150 students without the advantage of a dedicated testing facility. My experience with having students sign up for test sessions of their choice during a previous term was so negative that I actually considered going back to paper and running Scantron. But after working out how much trouble it would be to prepare and track different paper test versions and report back to students their grades in a confidential and timely manner I decided to avoid that route. I still ended up using WebCT/Blackboard to deliver the tests but I only set up two back to back testing periods. By reserving all the computer rooms on Sundays I assigned students with last names starting A-L the first session and M-Z the second. That way there was no problem with students not signing up in time or repeatedly changing sessions. For students who could demonstrate a genuine conflict I let them schedule a time with the proctor, as long as it was BEFORE the Sunday test date. Most students who reschedule want to take the test as late as possible so there were few students who requested this. Also, instead of creating several tests in WebCT/Blackboard for different sessions, the proctor just used one version and kept changing the password. That made it convenient for everyone. I do miss the ability to provide students the convenience of a walk-in testing policy over the course of several days. I think that a testing facility where live human beings simply check student IDs and make sure nobody is talking or using notes during certain hours would be vastly more useful than any high tech browser lock-down or screen capture tools and cameras. These could be the same rooms that are used for teaching or general student use during other times. Students from any course using a course management system could reserve a certain time or simply try their luck during one of the scheduled general proctoring times. It is my impression that the absence of such facilities in most universities is a major obstacle for the widespread adoption of online courses, or at minimum online testing. I think the problem is that it doesn't obviously fall under the responsibilities of any single academic unit. 2) I continued to use Second Life on an optional basis both for running races, giving out molecular model kits to the winners. I also continued to accept extra credit assignments involving building 3D molecules with a poster explaining a concept related to class content. In the image shown below, Netty showed an example of an SN1 reaction involving a ring expansion via a 1,2-alkyl shift. This is a really difficult concept to grasp on paper - I remember struggling with it as an undergrad. I think it is helpful for the student to construct both the 2D and 3D representations in Second Life. There are a few more examples on ACS island - on my skylab in the SouthEast corner. 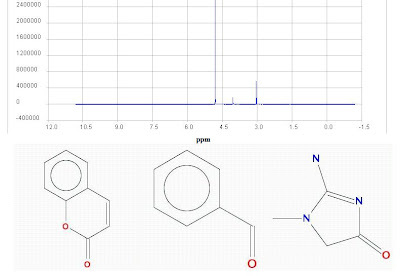 Andrew Lang has continued to make small improvements to the orac molecule rezzer to make it even easier to use. There is nothing like having students who have never seen or even heard of Second Life use a tool like this to determine user-friendliness and make necessary improvements. I'll be attending the "New Communication Channels for Biology" Workshop at UCSD on Wednesday. It looks like it will be very intense and I hope to see a few people from the Open Science movement there! The workshop will focus on the range of emerging approaches within e-science, community engagement in dialogue knowledge input/review or assessment, science blogs, and authenticated wiki-like research discussions and analysis, as well as the potential to formalize such community level contributions. These new approaches to communication are becoming important for biology as biological scientists attempt to address the inherent complexity of life, manage both high information content and high throughput data streams, and employ the opportunities emerging from advances in e-communication/networking and information technology. In part, this meeting has been stimulated by the success of the PSI KB Annotation Workshop, and by the general need within research both in metagenomics and structural genomics to understand the changing means of scientific communication and how we can best reach out to the community and have our work be enhanced in timely impact. The general case of getting input to genomic data from the entire community, third party annotation and not from only the original provider, is another driver for the need to extend communication beyond traditional publications, but the transformations in scientific dialogue / communication are much broader than just that within the genome community. Just got my invite for SciFoo 08 (August 8-10) - I look forward to another intense meeting and catching up with friends and collaborators! Last year was truly enlightening. Today, science is entering another period of accelerated change, thanks to the growth of the Internet and dawn of pervasive computing; the explosive growth of new sciences like genetic engineering, nanotechnology, biotechnology, and simulation; the rise of new scientific powers in the developing world, the revival of amateur scientists, and the growth of citizen science movements in the United States and Europe; the growth of new institutions supporting scientific research and innovation, and changes in the structure and funding of universities, government, and corporate R&D labs. Science in 2025 and 2050 is going to look very different than it does today. To map and make sense of all these changes, the Institute for the Future (IFTF) launched the X2 Project in late 2007. The purpose of X2 is to identify future disruptions, opportunities, and competitive landscapes related to the content and dynamics of global science and technology innovation; to develop a new platform for understanding global innovation trends; and to present this information to policy- and decision-makers, as well as the general public, in a useful form. The project conducts its research online, through an innovative experiment in open forecasting; in workshops with young scientists and engineers around the world; and in online games. Earlier this week, I attended the LISE08 conference at the Chemical Heritage Foundation in Philadelphia. The theme this year was New Media and Technology in Science Education and I talked about using Second Life in the chemistry classroom. David Shaffer gave a very entertaining and thoughtful presentation on epistemic games. These are games simulating complex systems like urban planning. Tom Tritton reviewed the conference for CHF. The Scholar2Scholar conference is upon us. Jay Bhatt and Anita Chiodo did an amazing job with organizing this from the start. I'll be giving the introductory talk on "Enhancing Scientific Communication through Open Notebook Science". Here are the slides - I'm starting with an introduction to Web2.0 using FriendFeed as an example. 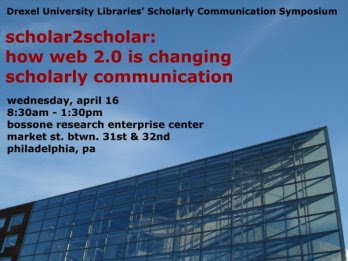 Join us to discuss how Web2.0 is changing scholarship. Dr. Jean-Claude Bradley will give a presentation, followed by a panel discussion featuring: Andre Brown, Nicole Engard, James Mitchell, Banu Onaral, Beth Ritter-Guth, and Scott Warnock. Small round-table discussions will follow. An optional Dutch-treat lunch concludes the day. Yesterday afternoon I attended the NFAIS conference in downtown Philadelphia. The talks were actually very engaging. First up was David Weinburger, who co-wrote the "Cluetrain Manifesto", an enjoyable book that I caught on audio book a few years back. His talk was mainly about his new book "Everything is Miscellaneous", which looks interesting based on his talk. His main point was that hierarchical classification systems are not as useful for many systems compared with spontaneous tagging by online communities. He also indicated that information overload was not as big of a problem as many people suggest, something that I definitely think is the case in science. I presented at the next session on "The Emerging Culture of the New Information Order" on Open Notebook Science, which was a good fit, giving a laboratory researcher's perspective of Web 2.0. I am co-organizing the Scholar 2 Scholar conference with Jay Bhatt and Anita Chiodo on the morning of April 16, 2008 at Drexel University in Philadelphia. Anyone wishing to attend add your name to the participant list on the wiki. Web 2.0 technologies are more than just web-based games and social networks; these virtual environments are building communities of thought and practice which have very real implications for education and research in academia. How do educators, administrators, and librarians use or repurpose these tools to their advantage? What are the implications for teaching and research? Is the return on our investment of time and energy worth the engagement? How well do students learn through these collaborative avenues? What are the true benefits for scientific research? What are the potential conflicts or roadblocks? We will explore these questions and many more. The Journal "Open Medicine" has published a very thoughtful editorial on "Open science, open access and open source software at Open Medicine" by Sally Murray, Stephen Choi, John Hoey, Claire Kendall, James Maskalyk and Anita Palepu. Open Medicine is an open access journal because we believe that free and timely access to research results allows scientific knowledge to be used by all those who need it, not just those who can afford expensive journal subscriptions or user fees for individual articles. But is access to the final polished version of research enough? Could we do more to en­courage the collaborative reuse and reanalysis of existing data, or the verification of analyses? Could we move from open access to open science? The American Chemical Society will be offering a virtual poster session in Second Life from selected posters at the Sci-Mix session taking place April 6, 2008 at the next national meeting in New Orleans. I'm helping out with that effort and I'm pleased to say that we have our first submission from Jodye Selco, Mary Bruno and Sue Chan: "Safe and economical chemistry inquiry for the K-12 classroom". ACS island has the same shape as its logo of a phoenix, thanks to the skilled hand of Eloise Pasteur who carved out the Drexel island's dragon shape. The posters will be placed on the right wing, next to a "chemistry museum" area, also under development. ACS island is currently open to everyone - feel free to stop by and explore as we develop the area (Andrew Lang, Hiro Sheridan in SL is also on the project). Gus Rosania has been a very active "resident scientist" - you can see his activities on drug transport near the middle. Kate Sellar (Finola Graves in SL), who spearheaded this initiative at ACS, has just started a blog where she will chronicle activities on the island. The easiest way to find the island is to type ACS in the Map search box in Second Life. Drexel Island and my teaching of chemistry on Second Life is covered in a recent Chemical Heritage Foundation podcast "Distillations". Cyrus Farivar interviews me and my student Charles Sineri. CT: Conversely, what are some things that work really well in Second Life? JCB: One thing new that I've done this term is have students do a project in Second Life. CT: Yes, you recently wrote in your blog that one of your students created a life-size model of a molecule as part of that. That sounded really cool. JCB: Right. To be able to stand next to a molecule that is as tall as you are, and to have your teacher be able to walk around it with you and comment,... that's pretty useful. CT: Do you have advice for instructors who want to integrate Second Life into their course? JCB: You should have a really good reason to do it. The best advice is to find another teacher who is actually using it, and try to experience what the student is experiencing. You'll get some ideas and advice from that. I was just talking to another teacher an hour ago who might be doing some things in Second Life. She's also an organic chemistry teacher. I told her, just send your students to Drexel Island; have them interact with my students, click around on the quizzes, and if you think it might make sense, you can spawn off from that. A lot of people have bad experiences in Second Life because they don't have a good reason for going there. It's like having people go to the Internet without a Web address. You want to be guided. That's the best possible scenario. It's just another tool. I wouldn't teach exclusively on Second Life. We have WebCT Blackboard; I have my wiki; I have my blogs; and those things all have their strengths. You've got to leverage them all. Another quarter done at Drexel and it is time for a brief post-mortem analysis of my teaching this term. I taught CHEM 241, introductory organic chemistry. In order to standardize testing conditions with other instructors of the course, my tests were run under closed book rules. Many years ago I opted for an open book policy after comparing performance under open and closed conditions. There was no significant difference, which I would expect for subject matter that has more to do with understanding rather than memorization. Open book tests are much easier to monitor and I was able to run a walk-in testing policy lasting several days using only video surveillance. Moving to closed book conditions required a proctor. This would not be a big problem for a small class. But my class had 175 students and our computer rooms only have about 25 machines and are usually in demand. Based on previous student behavior with a walk-in policy in effect, not more than half the class typically showed up before the last day. So I booked a room with more time (at least 6 hours) on the last day and shorter sessions on previous days. This worked fine for the 90 minute tests but we ran into a crunch on the last day of the final exam with a 3 hour duration. Luckily, I had an extremely competent and flexible proctor who handled the situation by finding additional rooms and extending the time. In fact the proctor was there for a total of 13 hours on the last day. In terms of security, I made use of the "proctor password" tool in Blackboard/WebCT and changed it at least once per day. Although there is some IP filtering possible with BB/WebCT, the restriction is not specific enough to isolate specific classrooms. Next term, we can solve a lot of these problems by allocating specific students to designated classrooms and using a printed class list where the students will show ID to the proctor and check off their name immediately before taking the test. Unfortunately, this removes the convenience of multi-day walk-in testing, which many students appreciated. There are probably many instructors out there with large online classes and I would like to get some feedback on how they handle testing under closed book conditions. From what I gather most online programs rely on the honor system. The other major news this term is that one of my students executed his extra credit assignment building molecules in Second Life. On Friday November 30, 2007 I was part of a panel for a Virtual Biomed Workshop at Drexel. I gave a little tour of Drexel Island. My account froze for a few minutes. Luckily Sean Brown took the reins and showcased the Biomed Floor that he built in the main building. The projection screen was huge and the video recorder did a great job of capturing the tour. This term, the students in my organic chemistry class were presented with an opportunity to do an extra credit assignment using Second Life to represent concepts they learned in the course. When I was an undergraduate, finding molecules in articles was mainly done using the Chemical Abstracts books. A convenient way to find a specific molecule would be to look up the molecular formula and find the corresponding IUPAC name. Theoretically, one could figure out the IUPAC name from scratch but this can be very tricky for complex molecules and prone to error. With the correct name, I could look for analogues of a molecule of interest in alphabetical catalogues by understanding how the chemical name works. But when computer databases started to be used in chemistry, using the name of a compound became far less important. Searching for molecules now comes down to drawing them on computer screens and using computer generated text representations like SMILES and InChI. Knowing how to use these tools on free software and services is key to being fluent and flexible on the chemical web. And I think that is the most important benefit that students get from doing these assignments. As an example, take a look at the project created by my student Charles Sineri (Chaz Balbozar in SL). In the image below he is standing between two molecules of camphor that are mirror images of each other, demonstrating the concept of chirality that we covered in class. This is a particularly difficult example to demonstrate on paper. In order to get his project done Chaz had to learn about and use SMILES, InChIs, ChemSpider and ChemSketch. These are free tools that he will use again in future chemistry applications. The main challenge in getting this implemented in Second Life is providing tools that are easy to use. We used Andy Lang's (Hiro Sheridan in SL) molecule rezzer to do this because it now has the capability of understanding InChIs and SMILES. Hiro was kind enough to make some further modifications to make it even easier to use. It was gratifying to see that it understood chiral SMILES code. Visit Chaz's project on Second Nature island - see SLURL. Berci Mesko will be moderating a session on Nature's Role in e-Science on SciFoo Lives On (in Second Life) tomorrow Monday December 10, 2007 at 12:00 ET/17:00 GMT. Beta Beta Beta and the Office of Residential Living will sponsor a stair run Saturday, December 8, 2007, from 9 a.m. to noon in University Crossings (101 N. 32nd Street). Registration is $3 per person, $5 if two people sign up together. Sign-up in the lobby of University Crossings. All the proceeds generated from the event will purchase mosquito netting to be placed over beds for an African village. 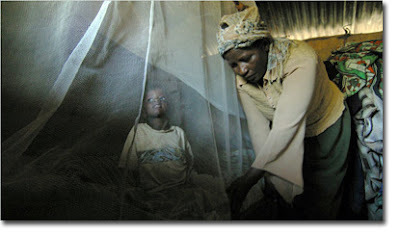 Each net costs $10, and can potentially save three people, as children in the villages typically share beds. More information about this initiative is available at http://malarianomore.org/. Cameron Neylon gave a very thoughtful talk at Drexel on Friday about using blogs to capture the science going on in his group then deciding to open his laboratory notebooks to the world. He was refreshingly honest about his progress and motivations. For example, at one point he noted that a gel image was missing on one of the posts. Instead of glossing over it, he pointed out how this just makes transparent how difficult it is to properly maintain a laboratory notebook. As long as you don't have to show it to anyone, it is tempting to claim that your lab notebook is better maintained than it really is. And this is a positive thing - science is messy and even through the human failings of ideal record keeping, science gets done. Now if we finally admit to that and are willing to work transparently, we have an opportunity and an incentive to set a higher standard. That is one of the tangible benefits of Open Notebook Science. Cameron's talk was recorded and is available here. The modern biochemistry or molecular biology laboratory generates large quantities of data that are generally stored across multiple computers attached to multiple instruments. Much of this data is never published and the majority languishes on old computers and is ultimately lost. At a local level this is a frustration for investigators who will often struggle to obtain specific pieces of data produced in their own laboratory. On a larger scale this is becoming a much more serious issue with the obligation of researchers to funding bodies to both preserve research data and make it available to other users increasingly becoming a formal a condition of publicly funded grants. Systems are required that can capture and preserve data along with sufficient information and metadata to make it possible for others to use this data. In parallel with this a movement is growing within the research community that advocates greater openness in providing both the raw data from published studies as well as making available the large quantities of data that are never published. The logical extreme of this approach is Open Notebook Science , pioneered at Drexel University , where the researcher’s laboratory notebook is made available on the internet as it is recorded. Achieving the aims of Open Notebook Science also requires systems which can capture data and provide it in a useful format. In addition these systems must make the data visible to relevant online searches. We are developing and using an electronic laboratory notebook based on a Blog format to capture experimental data in a biochemistry laboratory [3,4]. Within the system each sample is recorded in a single post. Analysis and manipulations of the sample are recorded in separate posts with links back to the input sample and forward to any products. All the information is made immediately available on the Web as it is recorded. The Blog engine has been specially built in house and has a number of features designed to enable and encourage the effective capture of data and metadata in the environment of a biochemistry laboratory. I will describe the Blog system and our evolving approach to capturing metadata as well as the process of integrating this with other web services to provide an open environment for recording work in the laboratory, laboratory materials, and validated procedures. The challenges and problems encountered in reconciling the twin aims of capturing data and making it available and readable will also be discussed along with the similarities and differences emerging between different approaches to Open Notebook Science [2,5,6]. News about E-Learning in the College of Arts and Sciences at Drexel University.